the trip was coming to an end. The students boarded the coach they arrived on and made their way safely back to school at approximately 4:30pm, where the students finished their journey. 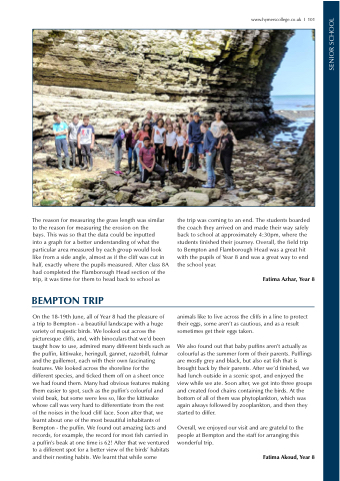 Overall, the field trip to Bempton and Flamborough Head was a great hit with the pupils of Year 8 and was a great way to end the school year. animals like to live across the cliffs in a line to protect their eggs, some aren’t as cautious, and as a result sometimes get their eggs taken. We also found out that baby puffins aren’t actually as colourful as the summer form of their parents. Pufflings are mostly grey and black, but also eat fish that is brought back by their parents. After we’d finished, we had lunch outside in a scenic spot, and enjoyed the view while we ate. Soon after, we got into three groups and created food chains containing the birds. At the bottom of all of them was phytoplankton, which was again always followed by zooplankton, and then they started to differ. Overall, we enjoyed our visit and are grateful to the people at Bempton and the staff for arranging this wonderful trip.